Creativity Bites Back! 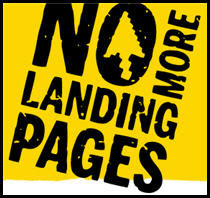 : No more landing pages? But would you agree that optimization can easily turn into a dedication to the minutia, to the detriment of bigger picture thinking? It's like we aren't seeing the forest through the trees. Landing pages aren't user interactions, they aren't experiences. So, I think with No More Landing Pages we are trying to encourage discussion around alternatives to landing pages, that ultimately yield better results. I have to answer yes and no (sorry for being so definitive!) :)) But while I agree that a lot of times there is a dedication to the minutia that does not help at all, and re-thinking the whole 'concept' may be much more useful, lading pages are still the best way to 'start a dialogue' in some specific cases. For example: if your site has multiple targets, that will visit you for very different reasons and services, your ads will perform better if they are segmented accordingly. But then, you need to follow up that first click with 'something' that is still talking to that target. And that is most of the time when landing pages may be useful. But I also feel that a lot of times companies execute some internet marketing (call it landing pages or viral or...), just because it is 'in vogue' without really understanding the concept behind that specific mechanism. No, not everybody needs a landing page and yes, it is ALWAYS useful to re think concepts because the world changes, people change, and more important than that, the online world is constantly changing and morphing! Now, my 'critique' was written before you expanded your concepts in your website. That is exactly what I was looking for. Not just a statement saying 'lets rethink' but an actual draft that could help get the ball rolling. Like your last article of how to do better. I will be visiting your site from time to time, but still, keep me in the loop of what you are doing..